The flashing LEDs on your charger indicates an Error Condition. Read below for a quick guide on the Error Conditions on the GX Series Industrial Chargers. Advanced Diagnostics is used when displaying Error Conditions. It will display a series of blink sequences that help you identify the cause of the error and potential solutions. 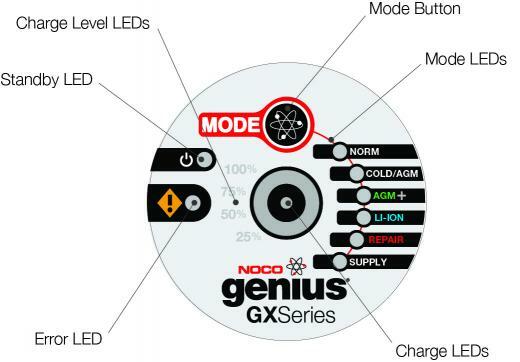 All Error Conditions are displayed with the Error LED and Standby LED flashing back and forth. The number of flashes between each pulse denotes a potential Error Condition (except reverse polarity and low-voltage battery). Battery will not hold a charge. Have battery checked by a professional. Possible battery short. Have battery checked by a professional. Battery voltage is too high for the selected charge mode. Check the battery and charge mode. Abnormal AC grid power: VAC <85V or >250V, or Frequency <45Hz or >65Hz. Reverse polarity. Reverse the battery connections. Battery voltage is too low for charger to detect. Verify connection and mode selection, if still not working use Supply Mode to raise battery voltage.